Islamists know from decades of success that deception is their most effective strategy, but nowadays many have grown egos so massive they just can't help but brag loudly about the ideological con job they're pulling on American Muslims. "Alhamdulilah [Praise be to God] for Islamophobia! ... Thank God for Islamophobia that causes us to grow and develop a strong Islamic identity... You can persecute Muslims but you can't stop the idealogy[sic]." This is the largest annual Muslim gathering in the country, these statements were at a speech by one of the organization's leaders and they were tweeted out to over 56,000 followers. Imagine if the leading black and Jewish organizations offered up similar sentiments at their yearly gatherings and then broadcast them out for the world to see. "Thank God for racism that causes us to grow and develop a strong black identity!" "Thank God for antisemitism that causes us to grow and develop a strong Jewish identity!" 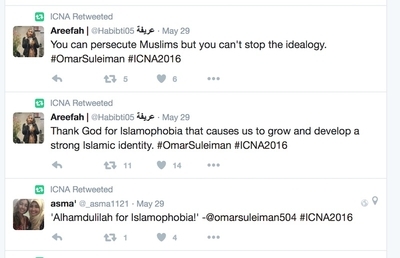 What is the real agenda behind organizations like ICNA pushing "Islamophobia"? Now we have an open admission: to fuel the rise of an ideology built around a "strong Islamic identity."